If Manchester City are to break Liverpool hearts again, then it may well be the man who was part of the Reds' last near miss who provides the hammer blow. 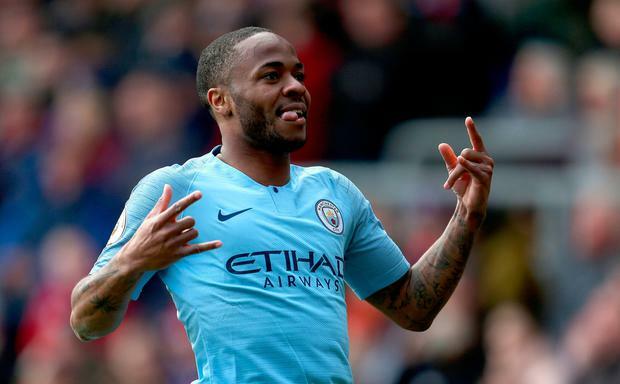 Raheem Sterling was a teenager in the Liverpool team who slipped up against Chelsea in 2014 and effectively handed the Premier League title to City. 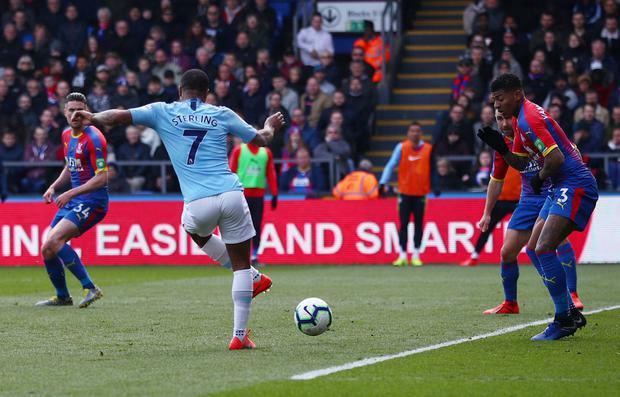 Ahead of the 2019 rerun of that famous Anfield match, Sterling made sure Liverpool could not afford another slip with two goals for City at Selhurst Park, which took his tally to 21 in all competitions for his club this season. Sterling stepped up as Sergio Aguero suffered a rare off-day and was eventually replaced by Gabriel Jesus, who netted the visitors' third goal. The fact Sterling shook off a glaring early miss to go on and score twice perhaps best demonstrates his progress over the past couple of years. He also made a big contribution defensively as he supported Kyle Walker to help minimise Wilfried Zaha's threat. Sterling's mental prowess matches his physical ability and one senses that he feels ready to have a big say in the destination of the title. It says much about how key Sterling is to manager Pep Guardiola that he was not among those rotated between the Champions League tie against Tottenham Hotspur and the trip to Palace. Kevin de Bruyne and Leroy Sane were rested at Spurs, but both returned to play key roles yesterday and will surely retain their places for Wednesday night's Champions League second leg. It was De Bruyne who set up Sterling for his first goal in the 15th minute. Ray Lewington, the Palace assistant manager, had been waving his team forward when Vincent Kompany headed the ball away from his own area and it eventually dropped to De Bruyne. 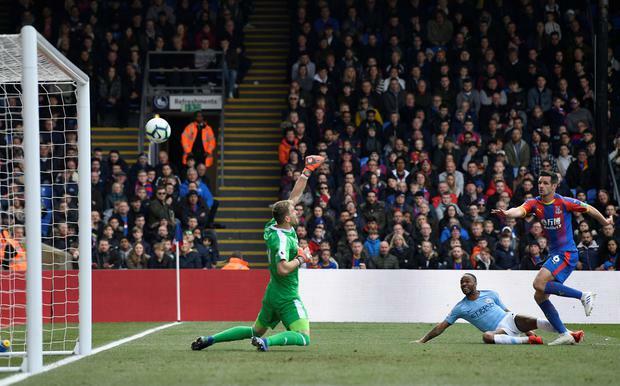 Still inside his own half, he brilliantly caught out Palace with a low pass that released Sterling, who beat Scott Dann for pace and shot past goalkeeper Vicente Guaita. Surprisingly, De Bruyne's assist was his first in the league since May, when he set up City's final goal of the 2017-18 season. Making Sterling's finish even more impressive was that just four minutes earlier he had missed a simple chance after being expertly teed up by David Silva. It was the kind of mistake that could have lingered on a weaker mind, but the 24-year-old is no longer one to dwell on errors. Whereas Guardiola had opted for a more cautious approach at Tottenham, yesterday City were back to near their dominant best, with Palace at times made to look like a collection of players drafted in to complete a training routine. On 'Masters Sunday', De Bruyne was reaching for every club in the bag with his range of passing. Palace had beaten City in December, but could barely get the ball off their opponents during a first half in which the visitors had 77pc of possession. Unsurprisingly, it remained one-way traffic in the second half. City's second goal came just after the hour as Walker, Aguero and Silva combined to work the ball to Sane, whose cross was side-footed in by Sterling. It looked a simple finish, but it required a cool head and perfect placement. 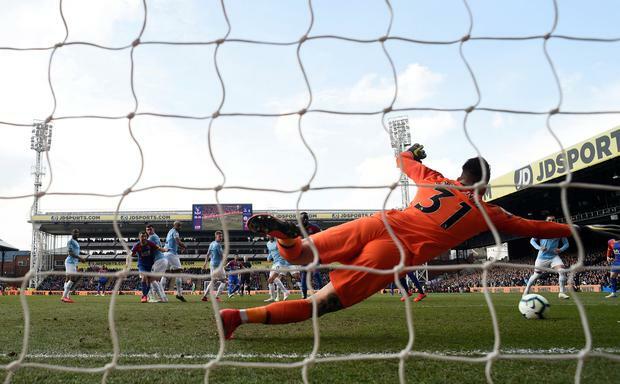 That should have made for a comfortable final half-hour for Guardiola's team, but Aguero was replaced by Jesus and headed straight for the dressing-room, before Luka Milivojevic gave Palace some hope with nine minutes remaining. 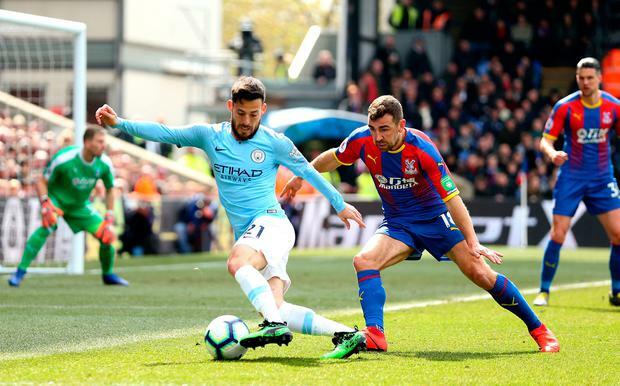 Kompany and Gundogan combined to foul James McArthur on the edge of the penalty area and Milivojevic stepped up to send his free-kick through the wall and into the right corner of Ederson's net. But as Palace pushed men forwards in search of an equaliser, De Bruyne broke and played in Jesus to calm any nerves, although it is hard to imagine Guardiola and his team feeling anything but confident. (© Daily Telegraph, London).